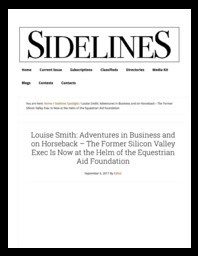 Sidelines--September 2017--In high school, Louise Smith was affectionately named The Class Instigator. She's the protagonist you want to follow because of her independence, quiet courage and taste for adventure. At only 5 feet and a bit tall, her diminutive stature and warm smile immediately put you at ease. She's unassuming and approachable. You'd never guess her background if you didn't know it.